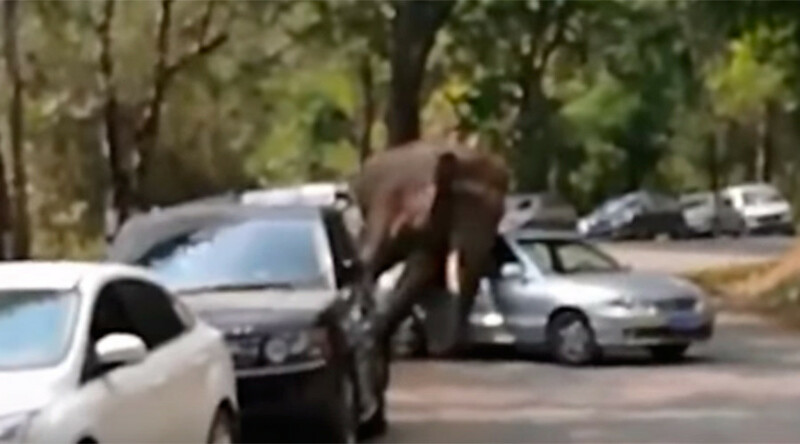 It’s never easy getting rejected just before Valentine’s Day, but it’s harder to swipe your frustrations away on Tinder or drown your sorrows in a bottle of whiskey when you’re an elephant – which, presumably, is why this dumped Dumbo took it out on a street full of cars. After losing a potential mate to another male, this wild elephant in China released some tension through a bit of stampy stampy, smashy smashy. Officials from Xishuangbanna said the male elephant wandered out of a nature reserve on Friday after being rejected, probably so his friends wouldn’t see him hit rock bottom. After about 20 minutes of “playing” with cars, he eventually realized he didn’t like her that much anyway, was probably better off single anyway, and returned to the reserve. No people were hurt in the rampage, except for the pachyderm’s big broken heart, which should mend after a good night on the town with some mates. A total of 15 cars were damaged, but not to worry, as the government said they will cover all repairs for those who don’t have an “emotionally fragile elephant rampage” clause in their insurance policy. Eyewitnesses seemed to enjoy the moment, too. “The tourists were quite excited to see a real wild elephant, and they were using their cellphones to take photos and videos. Even the owners of some damaged cars found the experience to be thrilling and very interesting, although their cars got scraped,” a government spokesperson said. Hopefully the elephant doesn’t feel too much shame, especially since he’ll never forget what happened. And besides, human breakups can be way more destructive and/or embarrassing.